Alleluia. Christ is risen: He is risen indeed. Alleluia! O give thanks to the Lord, for he is good; * his mercy endures for ever. The Lord is my strength and my song, * and he has become my salvation. I shall not die, but live * and declare the works of the Lord. The Lord has punished me sorely, * but he has not given me over to death. Open to me the gates of righteousness, * that I may enter and give thanks to the Lord. This is the gate of the Lord; * the righteous shall enter through it. I will give thanks to you, for you have answered me * and have become my salvation. The stone which the builders rejected * has become the chief cornerstone. This is the Lord’s doing, * and it is marvellous in our eyes. I would remind you, brothers and sisters, of the good news that I proclaimed to you, which you in turn received, in which also you stand, through which also you are being saved, if you hold firmly to the message that I proclaimed to you – unless you have come to believe in vain. For I handed on to you as of first importance what I in turn had received: that Christ died for our sins in accordance with the scriptures, 4and that he was buried, and that he was raised on the third day in accordance with the scriptures, and that he appeared to Cephas, then to the twelve. Then he appeared to more than five hundred brothers and sisters at one time, most of whom are still alive, though some have died. Then he appeared to James, then to all the apostles. Last of all, as to one untimely born, he appeared also to me. For I am the least of the apostles, unfit to be called an apostle, because I persecuted the church of God. But by the grace of God I am what I am, and his grace towards me has not been in vain. On the contrary, I worked harder than any of them – though it was not I, but the grace of God that is with me. Whether then it was I or they, so we proclaim and so you have come to believe. Early on the first day of the week, while it was still dark, Mary Magdalene came to the tomb and saw that the stone had been removed from the tomb. So she ran and went to Simon Peter and the other disciple, the one whom Jesus loved, and said to them, ‘They have taken the Lord out of the tomb, and we do not know where they have laid him.’ Then Peter and the other disciple set out and went towards the tomb. The two were running together, but the other disciple out-ran Peter and reached the tomb first. He bent down to look in and saw the linen wrappings lying there, but he did not go in. 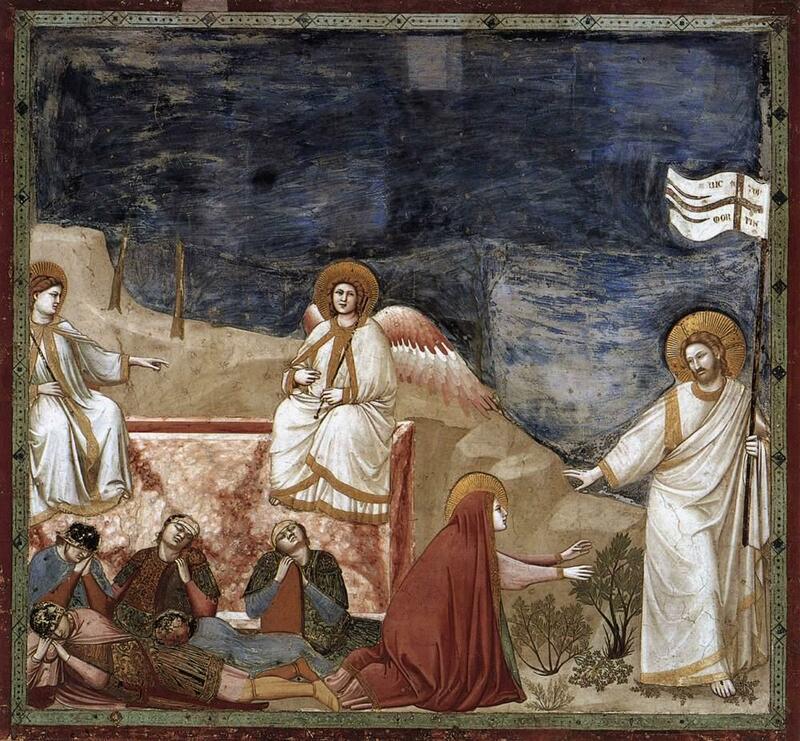 Then Simon Peter came, following him, and went into the tomb. He saw the linen wrappings lying there, and the cloth that had been on Jesus’ head, not lying with the linen wrappings but rolled up in a place by itself. Then the other disciple, who reached the tomb first, also went in, and he saw and believed; for as yet they did not understand the scripture, that he must rise from the dead. Then the disciples returned to their homes. But Mary stood weeping outside the tomb. As she wept, she bent over to look into the tomb; and she saw two angels in white, sitting where the body of Jesus had been lying, one at the head and the other at the feet. They said to her, ‘Woman, why are you weeping?’ She said to them, ‘They have taken away my Lord, and I do not know where they have laid him.’ When she had said this, she turned around and saw Jesus standing there, but she did not know that it was Jesus. Jesus said to her, ‘Woman, why are you weeping? For whom are you looking?’ Supposing him to be the gardener, she said to him, ‘Sir, if you have carried him away, tell me where you have laid him, and I will take him away.’ Jesus said to her, ‘Mary!’ She turned and said to him in Hebrew, ‘Rabbouni!’ which means Teacher. Jesus said to her, ‘Do not hold on to me, because I have not yet ascended to the Father. But go to my brothers and say to them, “I am ascending to my Father and your Father, to my God and your God.“’ Mary Magdalene went and announced to the disciples, ‘I have seen the Lord’; and she told them that he had said these things to her. Lord, on this day of all days we give thanks for your goodness and mercy, which endure for ever. Let us dance with one another, evangelical and anglo-catholic, charismatic and pentecostal, as well as those who fit no label beyond that of follower of Christ. May gratitude fill the heart of each and every one. Open for us the gates of the city, the city of harmony and peace. Then together, restored to unity, we shall enter them singing our songs of thanksgiving and praise. Lord of creation, we thank you for the cycle of creation, death and rebirth. After the bleakness of winter when it is hard to remember that new life is waiting, just under the surface, we thank you for the return of spring. We thank you for the example of your son, who fulfilled his destiny despite the bitterness of the cup, and rose from the dead and ascended into heaven. Now the green blade rises from the buried grain, wheat that in the dark earth many years has lain; love is come again, like wheat that springs up green. Lord, because He is risen we are together seeking your communion. Because he is risen, we find in your presence forgiveness, wellspring of a new beginning, and source of energy for the journey. Though we long to hold fast only to you, teach us draw strength and offer our own efforts to the people we live amongst: our communities and our neigbours, for they have need of us as we have need of them. Lord, you make the day dawn with promise. We pray for those who suffer in body, mind or spirit. When our hearts are saddened, grieving or in pain, by your touch you revive us and give us new hope. Be with us in our travails, and may we, too, see the green shoots of renewal. Lord, through the resurrection of your son light triumphs over darkness and life triumphs over death. In giving you thanks and praise, we bring before you those whom we love who have departed this life that, free from sorrow and pain, they may be one with you in your kingdom. These are beautiful prayers and l will use some or all on Easter Sunday at our 10am Eucharist Service. I often use this sight to inspire me, thank you and A Blessed Easter to you all. Irene St.Mark’s Church.